The Dow Jones Industrials are holding short of 17,000, and these tech giants are part of the reason. The Dow Jones Industrials (DJINDICES:^DJI) were 15 points above breakeven as of 12:30 p.m. EDT. If the index can sustain an advance, it will set its 13th record of 2014, with bullish figures from private-sector employment helping to boost confidence in the stock market. Yet Dow components Intel (NASDAQ:INTC) and Microsoft (NASDAQ:MSFT) posted small losses to hold back the Dow from larger gains and the elusive 17,000 mark. Still, from a longer-term perspective, both stocks have been instrumental in lifting the Dow this year. Total Return Price data by YCharts. Microsoft's was down 0.2%, having recovered from bigger losses of as much as half a percent earlier this morning. Microsoft is juggling a huge number of initiatives right now, including the launch of its Lumia 930 Windows-based phone in Hong Kong, a cross-licensing agreement with Canon to increase innovation, and joining an open-source project dedicated toward developing the Internet of Things into a unified structure unfettered by proprietary gateways. Yet Microsoft still lags badly in market share for mobile devices, and although speculation about a potential wearable-technology answer to a future Apple iWatch could create some excitement, the company will need much greater penetration of its hardware before shareholders see its efforts as ultimately successful. Early signs indicate Microsoft's presence in the cloud-computing realm has started out well, with subscription revenue for its software products offering long-term growth opportunities. Still, with plenty of competition in key markets, Microsoft can't let up in its efforts to sustain its leadership role among the Dow's tech stocks. Intel, meanwhile, fell nearly half a percent. Intel has worked hard to catch up to its rivals in the mobile and graphics chip space, with products like its Knight's Landing graphics co-processor and its refreshed Haswell and Ivy Bridge server-chip offerings setting the stage for future growth. Yet investors remain concerned about how much of Intel's recent strength has come from upgrades related to Microsoft's decision to stop supporting Windows XP, which helped temporarily reverse the long downtrend in PC sales as customers scurried to buy machines with newer operating-system software. It's easy to focus on daily movements of Dow stocks, but they can be misleading. 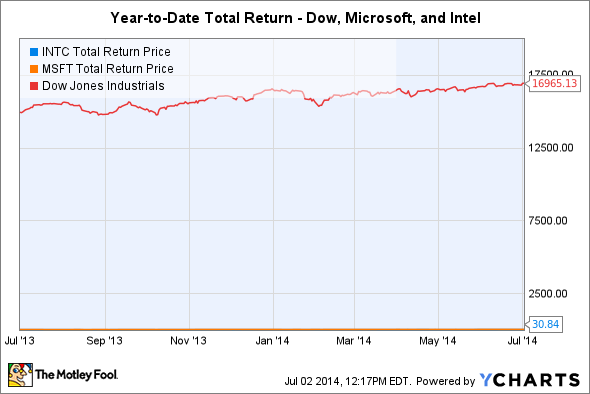 After supporting the Dow during the first half of 2014, Intel's and Microsoft's short-term drops could easily be related to trading moves with no connection to fundamentals. It's important for long-term investors to remember that when they look at daily market news.